If you engage in spiritual practice then you understand that all matter have vibrational frequency as everything exists as energy, including animate and inanimate objects. 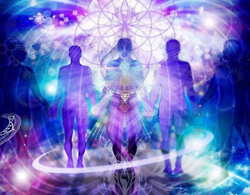 I became aware of energy and their vibrational frequency when my Kundalini energy rose. With this knowledge, I began to observe my attraction to others, and began reading about how we attract others through vibrational frequency. In my earlier post, “the Law of Attraction through Quantum Physics,” I posted about vibrational frequency through Quantum Physics, the study of particles on a subatomic level. Through Quantum Physics, it has been demonstrated that like vibrational energies attract each other. So what makes up vibrational frequency that cause us to feel attracted to and attract others? From my observation, vibrational frequency of an individual is a combination of our emotional landscape, karma or our past and present behaviors toward others, and our current feelings and thoughts . I believe that there may be other influences as well, but these are the major ones. Our emotional landscape is the compilations of all our emotional experiences from our present and past lifetimes. Throughout these lifetimes, we may have experienced trauma, such as the death of someone close to us at an early age, chilhood abuse, and other trauma such as sexual or physical assault, etc. These experiences from our emotional landscape create a certain vibrational frequency or signature within our energy field or aura. Here is a post on: Why Do We Attract What We Don’t Want? Our karma from our present and past lifetimes, whether positive or negative, also create a certain vibrational frequency or signature within our energy field. How we think and feel in our present life, whether positive or negative, create different signatures in our vibrational frequencies within our energy fields as well. The more attraction we feel toward another whether romantic or platonic, the more similar our signatures in vibrational frequency are with them. With our twin flames or souls, we have the most similar signatures in our vibrational frequency with them in each of the above identified areas. Our vibrational frequency may change when we heal our emotional wounds thereby changing our emotional landscape, resolve our present and past karma, and change the way we think and feel through releasing our egos. With these changes, we will lose our attraction to those who we earlier had a romantic or platonic attraction. If this happens with twin flames or souls, we will move onto another as the earlier twin no longer share our vibrational frequency. This is why we may have more than one twin flame or soul in this lifetime or future lifetimes as we have many souls with whom we may reincarnate in our soul groups who serve in this capacity to help us on our spiritual ascension.